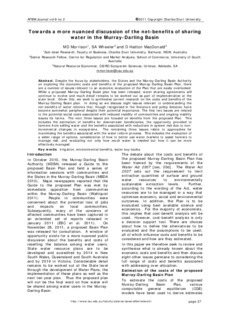 Despite the focus by stakeholders, the States and the Murray-Darling Basin Authority on exploring the economic costs and benefits of the proposed Murray-Darling Basin Plan, there are a number of issues relevant to an economic evaluation of the Plan that are easily overlooked. While a proposed Murray-Darling Basin plan has been released, water sharing agreements will continue to evolve and much detail remains to be worked out as part of implementation at the state level. Given this, we seek to synthesise current research on the costs and benefits of the Murray-Darling Basin plan. In doing so we discuss eight issues relevant to understanding the net-benefits of water reforms that, though recognised in the literature and policy debates, have become somewhat peripheral despite their potential importance. The first two issues are related to the potential social costs associated with reduced viability of communities and ongoing viability issues for farms. The next three issues are focused on benefits from the proposed Plan. This includes the estimation of benefits for downstream beneficiaries, the opportunity provided to farmers from selling water and the benefits associated with reductions in system risk due to non-incremental changes in ecosystems. The remaining three issues relate to approaches for maximising the benefits associated with the water reform process. This includes the evaluation of a wider range of options, consideration of how to better use water markets to assist farmers to manage risk, and evaluating not only how much water is needed but how it can be more effectively managed.